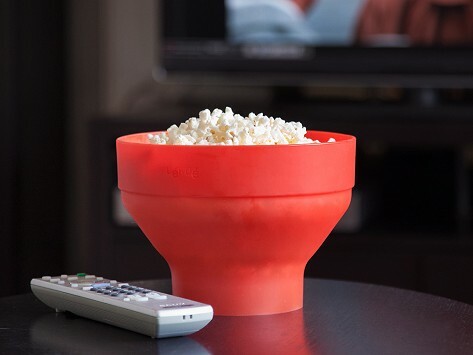 Make microwave popcorn that’s healthy and homemade in this soft, collapsible, silicone bowl. No saturated fats, worrisome additives, or microwavable bags. Dimensions: 7.9" x 7.9" x 5.7"
Best oilfree popcorn popper evah! I love this popper! It consistently makes great popcorn with little or no waste and it fold down for easy storage! I love it! For Lékué (pronounced lay-kway), the perfect kitchen is where you try out new techniques, jazz up your menus, and find easy ways to make everyday recipes healthier. The company was founded in Barcelona by José María Llorente, who envisioned a thoroughly modern range of silicone kitchenware that looks as great as it performs. Lékué's designs are focused on all sorts of users, from professional chefs to curious amateurs. The company is very picky about the silicone it uses. More elastic, smoother, and stronger than typical silicone, Lékué silicone is safe for the microwave, oven, dishwasher, and freezer. Function and versatility are core tenets of Lékué's products. With the foldable Steam Roaster, for instance, you can prepare anything from fish and meats to vegetables, omelets, and bread. 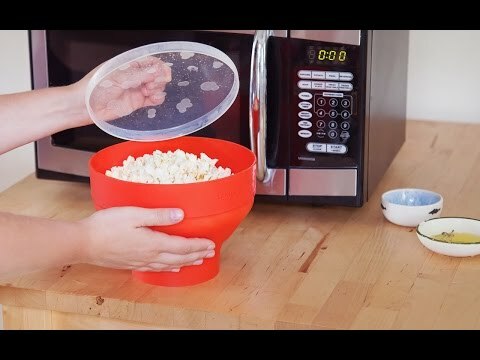 And the foldable microwave Popcorn Popper lets you prepare fresh popcorn (without the fat and added chemicals of other microwave popcorn) then serve it right in the bowl. Lékué tools aren’t just convenient. They help making healthier meals and snacks easier than ever.